In the United States, almost 40% of the nation’s river length and lake area have mercury fish consumption advisories . Discharge from abandoned mines is a primary source of mercury to California watersheds, where both mercury and gold were mined extensively . We have characterized watershed impacts from historic mining operations and evaluated the effectiveness of mine site and stream restoration efforts [3-5]. However, even low mercury inputs from atmospheric deposition can pose an ecosystem threat because mercury is a bioaccumulative toxin. It is important to understand how this contaminant cycles through terrestrial watersheds and to identify the mechanisms driving biologic uptake . 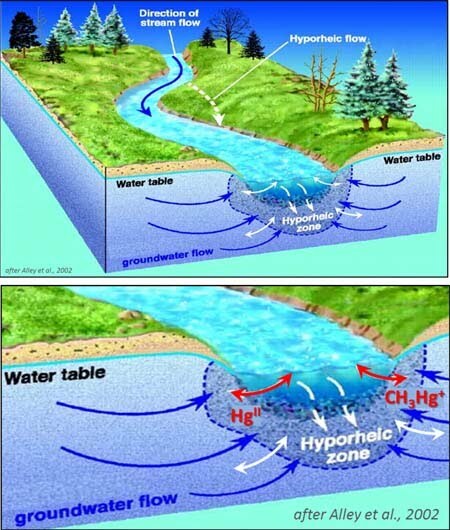 We combine hydrology and geochemistry to study the effects of groundwater-surface water interaction on lacustrine and riparian mercury dynamics (e.g., hyporheic zone processes ) and apply geomorphologic tools to evaluate mercury-sediment interactions (e.g., transport distance, depositional environments, and time scales for sequestration and erosion). US EPA, 2010 Biennial National Listing of Fish Advisories. 2010. EPA-820-F-11-009: p. 7. Alpers, C.N., M.P. Hunerlach, J.T. May, and R.L. Hothem, Mercury Contamination from Historical Gold Mining in California. USGS Fact Sheet 2005-3014 Version 1.1, 2005. Whyte, D.C. and P.M. Ganguli. The impact of mercury mining on Tomales Bay biota. in U.S. Environmental Protection Agency conference: Assessing and Managing Mercury from Historic and Current Mining Activities. 2000. Johnson, B.E., B.K. Esser, D.C. Whyte, P.M. Ganguli, C.M. Austin, and J.R. Hunt, Mercuryaccumulation and attenuation at a rapidly forming delta with a point source ofmining waste. Science of the Total Environment, 2009. 407(18): p. 5056-5070. Ganguli, P.M., R.P. Mason, K.E. Abu-Saba, R.S. Anderson, and A.R. Flegal, Mercuryspeciation in drainage from the New Idria mercury mine, California. Environmental Science & Technology, 2000. 34(22): p. 4773-4779. Wentz, D.A., M.E. Brigham, L.C. Chasar, M.A. Lutz, and D.P. Krabbenhoft, Mercury inthe nation's streams: levels, trends, and implications. USGS Circular, 2014. 1395: p. 100. Alley, W.M., R.W. Healy, J.W. LaBaugh, and T.E. Reilly, Flow and storage in groundwater systems. science, 2002. 296(5575): p. 1985-1990.